On the 10th anniversary of Synchronous Technology, Siemens PLM unveils the Next Generation of MCAD with Solid Edge ST10. Big advances in MCAD seem to arrive every ten years or so. In 1986, PTC introduced history-based parametric MCAD and just about everyone made it the standard way to model in 3D. A decade later, Solidworks 95 brought MCAD to Windows and competitors rushed to Microsoft’s operating system to mimic the success of the self-funded startup. A little more than decade further along, in 2007, SpaceClaim rocked the world with a revitalized direct modeling system, forcing competitors to acknowledge this old technology. From that, we got Creo from PTC, Fusion from Autodesk and Synchronous Technology from Siemens PLM Software. I’m not disregarding other tsunamis in tech, but things like the Internet, 64-bit CPUs and cloud computing apply equally to all software, not just MCAD. The most recent innovation in MCAD quietly arrived in 2015 and, like other advances before, attempts to solve a difficult problem. This time, it concerns how to merge and edit a single 3D body composed of both meshes and solid models. In the past, if you wanted to work with both, you had to convert one into the other: Either meshes into solids or shell solids into meshes. This isn’t ideal, as surface data can get lost in the conversion, and you might end up with an unusable result. In any case, meshes generated from 3D scans tend to be huge and complex, and so are unsuitable to be represented by solids. Figure 1: Siemens Solid Edge ST10 and NX11 feature Convergent Modeling, an MCAD design method that allows meshes and solid models to co-exist and be edited in a single part. It turns out that it’s tough to figure out the editing of both kinds of 3D models at the same time. The Spatial division of Dassault Systemes, for example, has been making only a few advances each year. This year, for instance, they added just two new functions to its Polyhedra hybrid editing API: Stitch (to directly combine meshes and solids into one body) and Move (to manipulate solid faces in a hybrid body). Note that Polyhedra is not end-user software, but an API that MCAD vendors would implement in their software through Spatial’s ACIS or CGM kernels. Spatial calls the imported 3D scans the “polygonal” model, and the 3D solid the “precise” model. Until recently, it was best to keep organic mesh data separate from 3D solid models. But now we have “hybrid” modeling. As an example, imagine creating a 3D solid model of a custom knee joint based on a 3D-scan of a patient’s knee. A typical editing operation would involve carving out some of the knee’s mesh model to make room for the solid joint; similarly, the solid joint can be edited to adjust to the knee’s mesh model (Figure 1). In the kernel world, the arch competitor to Spatial is Siemens PLM Software. It’s not surprising, then, that Siemens recently revealed that it too is working on hybrid modeling for its Parasolid kernel. Siemens calls its technology “convergent” modeling, because it converges meshes (which it calls “facet models”) and solids (or “classic b-reps”) into a single model. In classic MCAD industry fashion, the two competitors often take pot shots at each other. Siemens boasts that its technology is integrated into Parasolid, and so has “no delegation to an add-on modeling component.” (Polyhedral is an add-on to the ACIS and CGM kernels.) In an interview with me, Spatial accused Siemens of holding both representations separately internally, rather than truly converging them. For this year’s releases of Solid Edge and NX, Siemens added convergent modeling to its MCAD systems. Convergent modeling is integrated into Solid Edge ST10, but the company says it will continue to develop the technology in the coming years, just as Spatial will. 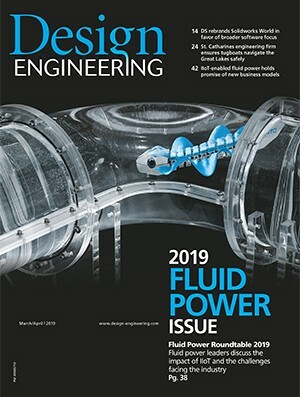 When Siemens first launched Synchronous Technology for mixed direct and history editing, it celebrated the new modeling technique by restarting Solid Edge’s numbering system; what would have been Solid Edge 21 became Solid Edge ST – the dawn of a new era in design. Except it wasn’t. A lot was missing from that first release, and even in subsequent releases of ST. A decade’s worth of updates later, users still can find it difficult to work in ST. Figure 2: A solid part (in green) removing a portion from a mesh part with convergent modeling. With this summer’s release of Solid Edge ST10, the tenth anniversary of synch tech, Siemens has a new master plan. Its MCAD programs will encompass the entire design process – from reverse engineering, through design, and finally output to 3D printing. Siemens calls it “next-generation design” but didn’t change Solid Edge’s numbering system, sadly; Solid Edge NG would’ve been cool. Next-generation design encompasses reverse engineering, convergent modeling, generative design and 3D printing. Reverse Engineering: When drawings don’t exist for parts, we draw them from scratch or we use scanners to do it more quickly. A scanner uses a laser to find the position and distance (x, y and z) of thousands of points on the part. Software connects every three points with edges, creating a 3D mesh model from the triangles. Designers then clean up the mesh model by removing facets, filling holes and smoothing the mesh in Solid Edge. Once clean, parts of the mesh can be turned into surfaces native to Solid Edge with its Identify Regions tool. Operations that convergent modeling can do include Booleans, sectioning, hole-filling, imprinting, extrusions, mass properties, clash detection and others. To use generative design, we tell Solid Edge the material, the constraints (like bolt holes), the loads and a weight we’d like the part to weigh. The software then automatically computes the geometric solution. This technology is not new, but has tended to reside in specialty software external to mainstream MCAD. 3D Printing: Siemens is making a big push towards 3D printing, also called additive manufacturing. This is no surprise, given that the company manufactures everything from tiny medical devices to entire railroad trains. Naturally, it now wants its design software to be designing those parts as well. But an interface is needed between the 3D model and the printed part. The part you model might have walls that are too thin for the 3D printer’s resolution; it might have empty areas large enough to collapse; or it might not even be able to stand upright on the 3D printer’s table. Software checks for these flaws and others, and then lets you adjust the model to be printed (Figure 4). Once the part is ready for printing, Solid Edge converts the model to STL or Microsoft’s new 3MF format, and then outputs it directly to Microsoft’s 3D Builder app or uploads it to an online 3D printing service. Figure 4: Solid Edge ST10 analyzes designs prior to 3D printing and warns users that their model may not output successfully before. So there you have it; a design sequence that runs from reverse engineering through to 3D printing. Next Generation Design is a big vision from Siemens that encompasses the design process end-to-end. I consider it a spectacular addition to Solid Edge, but core Solid Edge users will probably consider it only peripheral. They continue to be concerned primarily with 3D modeling, 2D drawings and updating designs – as are most CAD users, no matter which package they embrace. On a side note, the formerly singular Solid Edge University event, held each October, has been regionalized into dozens of events throughout the year in individual cities and countries. I’m not surprised, given that only about 500 enthusiasts showed up at the annual event, a tiny number given the half-million users claimed by Siemens. Nevertheless, the addition of Next Generation Design and continuing development in other areas of Solid Edge is heartening, because it proves Siemens is serious about supporting Solid Edge into the future. Over time, I’m certain hybrid modeling will seep into all forms of MCAD, just as direct editing did a decade ago.